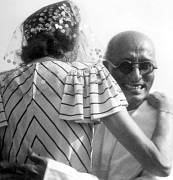 Chakravarti Rajagopalachari at work, c. 1945. Chakravarti Rajagopalachar(centre) and Bhulabhai Desai, c. 1945. Chakravarti Rajagopalachariat the farewell function for the Mountbatten’s, Delhi, June 21, 1948.